My mom and I hit up the Allegan Antique Market last Sunday and we came out winners for sure. 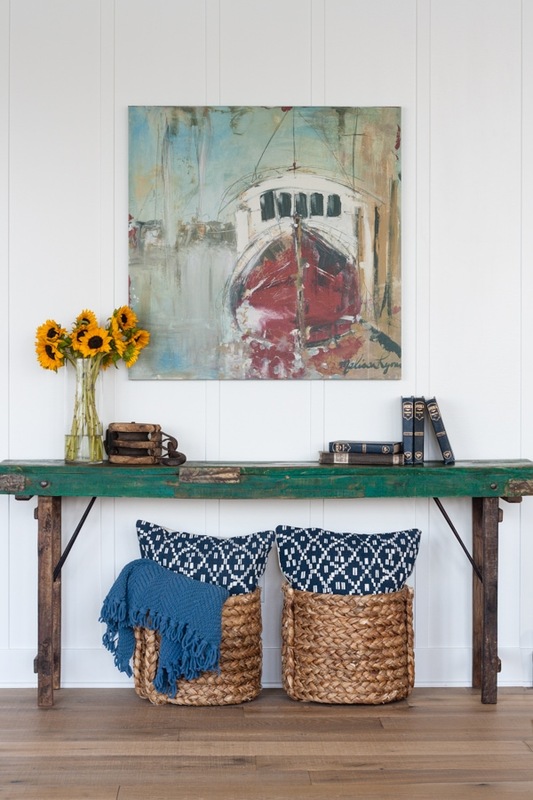 I finally found the perfect table for underneath my Melissa Lyons Boat Print. If you follow me on instagram then you may remember me polling you all on what color table to put underneath it. I wanted something fun with a pop of color, but I was nervous about having a strong color so close to our blue kitchen island. Most of you wanted our old red buffet from the last house (this painting used to hang above it in our dining area), but we tried it in here and the dimensions sadly weren’t quite right. 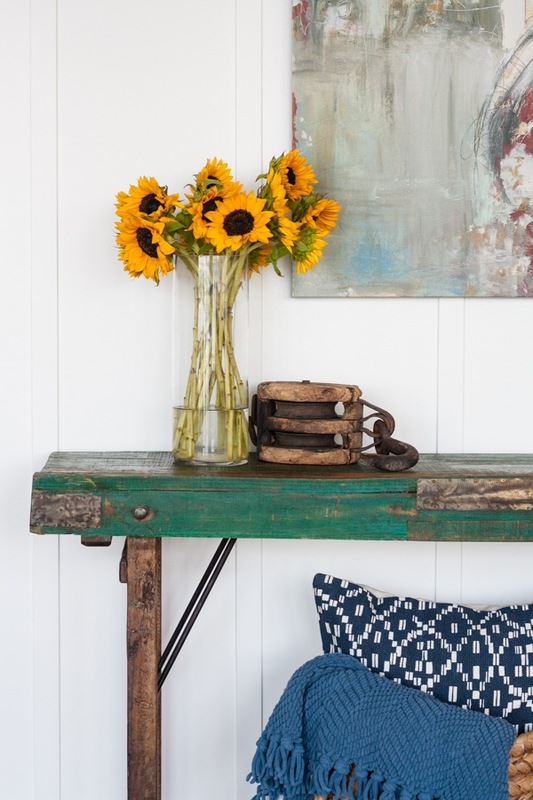 I saw this green console table out of the corner of my eye at the flea market and made a beeline for it! The top was covered in stuff, but it was totally calling my name. I even did the whole “I’ll stand here with my hand on it, you go ask him how much it is” thing because I was worried someone else would try to snag it out from under me. Mind you there was no one else in the booth, but it was just one of those things where I knew it was coming home with me. I snagged it for $100. I asked the guy if he knew what it was made out of or what it was, because the detailing on it was so cool. He told me it was an ancient Indian wedding table…and then proceeded to laugh hysterically. He also offered to hold on to my “thermometer” for me while I shopped, which after much confusion, I realized he meant the old oar I was holding…so, I’m just going to go out on a limb and say he may not be a reliable source of information. He was a character though, and I will definitely visit his booth again next month. I talked to a guy at a different booth who had tables similar to this that he had made out of old scaffolding so that could be the case here too. Whatever it is or made out of, it goes perfect in this space. It really complements the colors in the painting. You can find more of Melissa’s gorgeous art here. I have another piece of her’s in my bedroom that I can’t wait to share with you soon! The baskets under the table are a temporary fix. I really wanted some sort of stools under here that we could pull out for extra seating and I found some cute ones (I did a bunch of instastories on them), but they didn’t really work with the legs of the table. I was tempted to keep them because I just wanted it to feel finished over here, but I’m trying to be really intentional about only buying new pieces that are perfect and I absolutely love. Now I’m thinking larger baskets or more of an ottoman idea, but these baskets and pillows are doing the job for now. I’m so happy to finally have this painting feel more grounded. I still need to work on styling the table a bit more too, but I couldn’t wait to share my fun find with you all! What a find on that table! Love the quick fix! Love it! Yes, I saw this on your IG stories and was looking forward to seeing what you would choose. 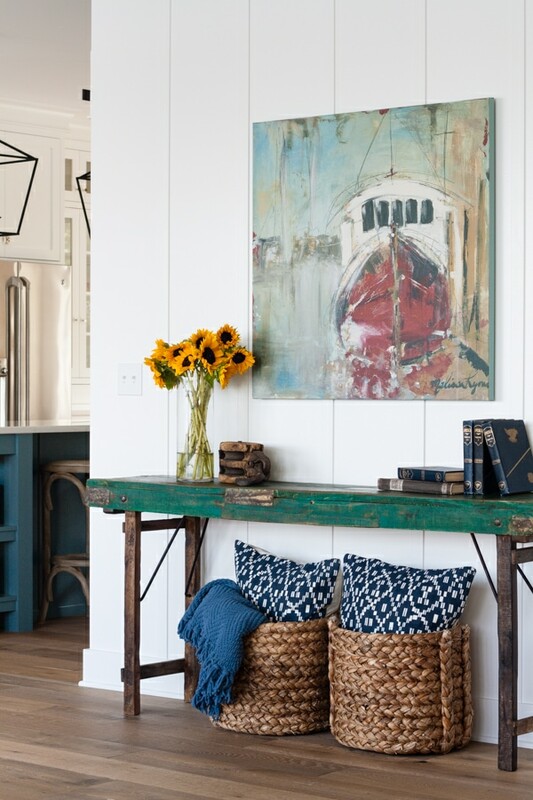 The baskets look so cute and the blues compliment the kitchen island. I’m assuming you’ve looked on the Birch Lane and Ballard websites? They have so many ottomans and stools. I have those same baskets! They’re so versatile. I really like it! Where is the picture from? This is darling! The whole thing…. I actually love the baskets and pillows under it. I thought to myself “what a great idea, I should do that somewhere”. Thanks for sharing. I do not get any credit for helping wrestle that thing to the truck? 😂 It was such an amazing find and it looks awesome under the painting!! What a perfect piece under your picture! Looks great! I love your table! I saw one similar (but not the fun green like yours) At Brimfield for the same price. The vendor told me it was a painter’s table?? Anyway, I love yours and now I’m having buyers remorse that I didn’t buy that one at Brimfield. Really? I recently found out this is actually a wedding table, so neat! Love the table…. 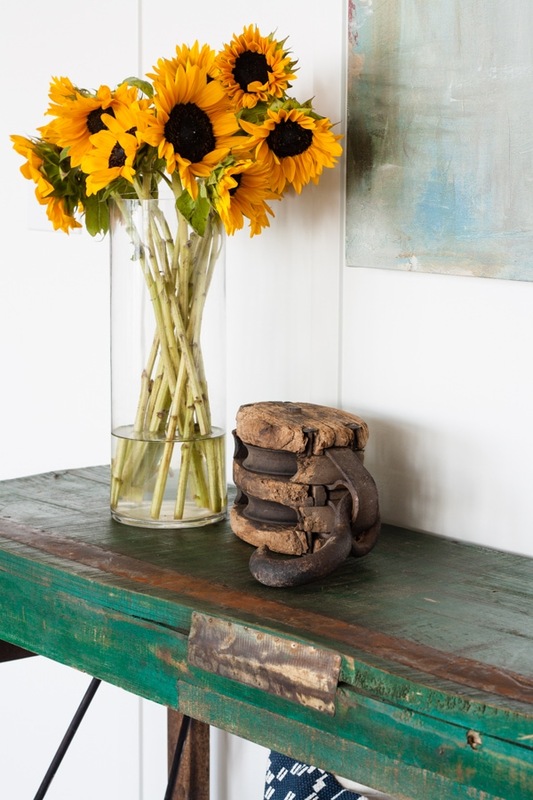 you cannot over state the value of a great rustic find like this that is such a perfect fit! I love your taste. It looks beautiful! I agree love those one of a kind pieces, they can totally make a room! Love how it’s coming along. Darn! i missed your Instagram story. :-( Can’t wait to see what else you do. Love this table- what a great find! Oh, my! I love, love, love that table! What character! It is incredible there! You have such a touch with decorating and an old piece like that is just right mixed in with the new. Perfection! I’ve never been to the Allegan flea market and I’m going to have to check them out. Love the artwork and how everything mixes so well! It’s so fun, you should definitely go! 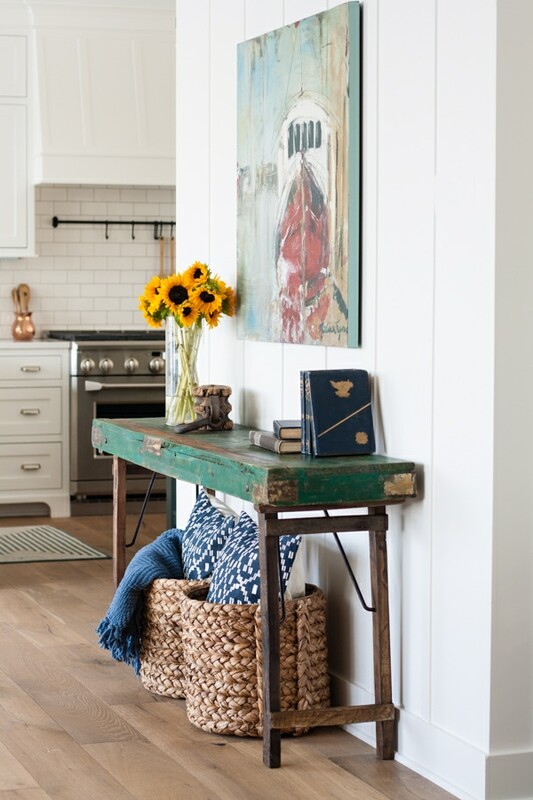 Love the table and I think the baskets underneath look fantastic. Adds a little texture and softness to the rustic table. Love scoring those great finds!! Yes I agree about the softness, thanks! I love how the blue of the pillows and throw kind of tie into the blue in the kitchen. Like a transition! Its wonderful. Thanks Linda, it worked out really well! Reminds me of a wallpaper’s table but may it be wide enough. What a great find. I did see a bunch of those there but this one isn’t quite that wide, they are so cool though! What an awesome table and a great find! Love it. So pretty! I love your new home so much! Can’t wait to see the rest of it! It looks amazing, I love how you put the colors together, it is so pleasing to the eye! I had two friends that were at that same flea market last Sunday and found some awesome treasures too. One put a picture of an old crate that was marked with Owosso Mfg. Co. on it and a lot of my family lives in Owosso, so she thought we would admire it. She said it was an egg crate from the 1920’s…would have loved to had that! Oh that sounds so cool, it’s such a great market! I’m hoping to make it to the one in September again. beautiful. Can you share the flea market vendor name? Sounds like he is a character with lots of great finds. Would like to visit him at the next show. I didn’t catch his name sorry! Having been where you are right now, also give some thought as to how you will feel about this proximity when they are teenagers and you want to be aware of them coming and going at night. HI Jen, yes the kids are in the basement, I will be blogging more about the basement soon. They are 6 and 9 years old and I like having the separation, there is no door to the basement and our room is right by the top of the stairs so it doesn’t seem too far away. I feel like we all sleep better having a little more privacy. This was one of the main reasons we moved at the last house our bedrooms were right on top of each other. I have been a reader of your blog for some time now and miss your posts as I would say they are few and far between as I really look forward to them. Being an Indian, I think your ‘thermometer’ friend got it correct. It does look like one of the tables used at mass celebratory gatherings in India though I wonder how on earth it ended up there. Looks at home, though. Great find! Love it with the artwork and the way it’s not all matchy-matchy. I miss the Allegan Antique/Flea Markets (I used to live in Holland, MI). I have many pieces in my home from there! I was just in holland for lunch yesterday :) love it there! You are my SOUL SISTER! LOVE LOVE LOVE and only $100 WOW! You Nailed it! Hope to see just a few more chippy things with Soul in your home. Fabulous! I was going to our Big Texas “CANTON” first Monday trade days this weekend but it was just So hot, couldnt get the courage up to do it. Going at the beginning of September. Dang Texas Heat. Meanwhile Im over here drooling over that table. It looks like an old wallpaper table. They used it to spread out the paper and apply the sizing (sp?) to it. I only know this because I just got one myself. Love the color on yours! I did see a bunch of fun wallpaper tables there, this one is too skinny but I actually just found out it IS an old Indian wedding table, so cool! Missing your posts. Is everything alright? Have you started another blog somewhere else and I’ve missed it somewhere along the way? Hey Leanne, sorry my camera broke so I was out of blogging commission for a while! New post up today :) didn’t mean to leave you hanging! I absolutely love this old rustic style, it’s gorgeous! Some people would try to fix it, make it smoother, but I love it just like this. Thanks Diana, I love it too, so much character! What a find! This console table looks incredible, I love it. Thank you for sharing it! I have had my eye on those, they are so pretty! blues. Your decorating reminds me of my sister in laws. I Love your decor and your new home! Thanks for sharing with us.